Lafayette, Indiana is located on the northern banks of the Wabash River and has a population of about 56,000. Lafayette’s location at the northern most point of the Wabash River made it the transportation center of the United States in 1832. Lafayette’s ability to be a transportation center allowed for a strong economic base for manufacturing in the late 1800’s; even today new industries are attracted to Lafayette. Lafayette is also the site of the first air mail delivery in the United States in 1859 via hot air balloon. Experienced Lafayette lawyers are prepared to represent your legal issues. These attorneys can represent you in many diverse areas of law including: personal injury, bankruptcy, automobile accidents, tax, DUI, arson, assault, divorce, child custody and alimony issues and more. Lafayette is located in Tippecanoe County. Lafayette lawyers will try their cases in either Tippecanoe County Circuit Court or one of the 6 Tippecanoe County Superior Courts. Tippecanoe County Circuit Court has exclusive jurisdiction over all probate matters and shares general jurisdiction with Tippecanoe County Superior Courts 1 and 2. 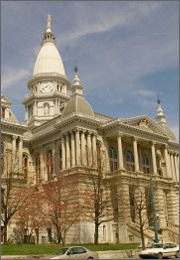 Tippecanoe County Superior Courts 1 and 2 are courts of general jurisdiction over all civil and criminal matters. Cases related to juvenile matters are heard in Tippecanoe County Superior Court 3. Claims related to landlord/tenant matters or felony drug charges are heard before Tippecanoe County Superior Court 4 while all felony criminal cases are heard in Tippecanoe County Superior Court 5. LegalMatch can help you find the right lawyer to represent your case in Lafayette. Whether you’re looking for representation on a criminal case or a family law matter, LegalMatch makes it easy for you to find the right lawyer. LegalMatch has an extensive listing of lawyers who can best represent your case that you can select from with no obligation.